For fantastic live TV services available across the country, DIRECTV could meet all your demands. DIRECTV is a satellite television service provider owned by telecommunications giant, AT&T. The company offers over 330 channels with a large number available in HD, 4K live programming, NFL Sunday Ticket, and a heavy promotional discount for your first year of service. However, customers will face a price hike halfway through their contract and additional fees for connecting multiple TVs. Despite this, we love all the great features and discounts that DIRECTV throws in for their new customers. New DIRECTV customers have six all-included plans to choose from. Your eligibility for discounted prices will vary depending on your location and you may see slightly higher promotional prices in some areas. Each of these plans is all-included, meaning you won’t be hit with additional DVR, receiver, or satellite dish fees. The only thing that sets the DIRECTV packages apart are the number of channels included. 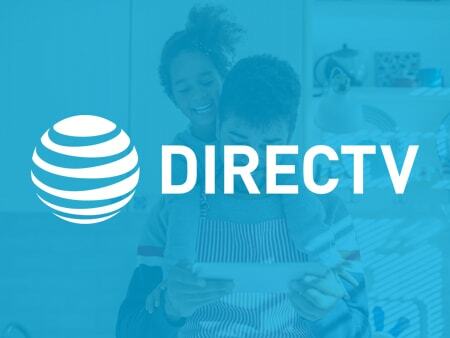 The DIRECTV SELECT plan is perfect if you’re looking for value, offering affordable entertainment and access to at least 155 channels including HGTV, Nickelodeon, TNT, Food Network, and Discovery. Their ENTERTAINMENT package is great for casual sports fans who want to watch ESPN, ESPN 2, and FOX Sports 1. From the CHOICE plan and up, you’ll get NFL Sunday Ticket for one year at no extra cost. The CHOICE plan includes a wide variety of 185+ channels from comedy to drama. Go with the XTRA plan if you want an even more impressive selection of channels including Nat Geo WILD, MTV Classic, and BBC World News. The ULTIMATE plan adds 14 movie channels to your line-up and PREMIER includes the DIRECTV Sports Pack as well as premium channels like HBO, Cinemax, and STARZ. DIRECTV throws in one free season of NFL Sunday Ticket on select plans. What’s Included in a DIRECTV Package? All of these packages include plenty of great features. For example, you’ll have access to thousands of On Demand titles and even a full-time, live 4K TV Channel. All DIRECTV packages include local channels, a free premium channel trial, and access to DIRECTV Everywhere. Plus, you can skip the $35 TV activation fee if you order online! With DIRECTV, you know exactly what you’ll be paying for your first year of service. Your monthly service fee will not increase until the 13th month of your agreement when you will be charged the regular pricing for your plan. It’s important to note that all DIRECTV packages require a 24-month agreement. Prices are guaranteed to not increase for your first 12 months. All DIRECTV customers have access to DIRECTV On Demand where you can find thousands of titles and even some movies available in 4K. DIRECTV also provides a live 4K channel, so you can watch sports, concerts, and other events in ultra HD. Just remember, you will also need a 4K TV to enjoy the 4K content! DIRECTV offers local channels in 99% of the US based on local availability. Most of these channels are available in HD and are included in your base service package. This is great because local channels can be difficult to find from other television providers and many people have to set up their own antenna to watch them. Regional sports networks are included on the CHOICE package and up. What’s Not Included in a DIRECTV Package? We mentioned that NFL Sunday Ticket is included on four DIRECTV plans. However, it is only free for the first season. Unless you cancel your subscription, it will renew the next year and you will be charged the full price (currently $293.94/season). You’ll also run into additional fees if you want to set up more than one TV in your home with DIRECTV. Your first DVR is free, but a receiver is required for each additional TV and will cost $7 each per month. So for example, if you’re hooking up 4 TV’s, you’ll be paying $28 per month just for equipment. Also, keep in mind that your service price will increase after 12 months even though you’ll be locked into a 24-month agreement. If you cancel early, DIRECTV will charge you $20 per month for every month left in your contract. It’s unusual for a company to increase your service charge halfway through your contract and this where DISH’s two-year price lock looks nice in comparison. If your base package doesn’t have everything you need, you may want to add some channel packages. The premium channel packages include HBO, SHOWTIME, STARZ, and Cinemax. These networks are free for your first 3 months and then cost $53.99 per month. Other premium add-on channels include the DIRECTV sports pack, DOGTV, and adult content channels. There are also a variety of international packages available from $4.99 to $30.99 per month, including those in Italian, French, Cantonese, Filipino, and Spanish. All DIRECTV plans include the company’s flagship receiver, the Genie HD DVR. The Genie HD DVR is a solid piece of standard television equipment with the ability to record 5 shows at the same time and store 200 hours of HD video. The equipment allows you to restart live TV if you just missed the beginning of your show or watch entire shows that aired up to 72 hours earlier. Sports fans will enjoy the ability to watch 8 sports broadcasts on just one channel and track their favorite individual players with the Player Tracker. Get Player Alerts when your favorite player makes a great play! You will also need a Genie Mini receiver for each additional TV you want to watch DIRECTV on. The Genie Mini receivers cost an additional $7 per month each. You’ll also have to pay a one-time charge of $99 to make your receiver wireless if you want a cordless connection to your TV. There is an additional upfront charge for your 5th and 6th receivers. The Genie Minis allow you to start a show in one room and finish it in another, or watch shows in multiple rooms at the same time! The wireless function will also get you connected to the internet, so you can access TV apps like YouTube and DIRECTV On Demand programming. If you spend a lot of time commuting on public transit or traveling within the country, you’ll appreciate DIRECTV Everywhere. DIRECTV movies and shows can be accessed by phone, tablet, or computer. Users can search through live programming options, pre-recorded DVR shows, and On Demand content to watch on the go. All DIRECTV customers can get a free 3-month trial of the premium channel package which includes HBO, Cinemax, SHOWTIME, and STARZ. This will give you access to loads of popular series including Game of Thrones and Westworld. Just remember to cancel your subscription before your three months is up or you will be charged for this package. Enjoy three free months of access to HBO, Cinemax, STARZ, and SHOWTIME. Installation is included with all DIRECTV plans, which means you don’t have to pay extra fees or set up anything yourself. A professional will scout out the best placement for your satellite dish and cable routing, then install all necessary equipment and connect each TV to your DIRECTV service. Before leaving, the technician will make sure everything is running smoothly and show you how to use your DIRECTV remote. Standard installation is quick and takes between 2-5 hours. Customers can subscribe to the DIRECTV PROTECTION PLANS starting at $7.99 per month. These plans protect you from paying for system damages and can be useful if you expect power surges or high-wind storms in your region. You can extend this coverage to entertainment devices, like your TVs, tablets, and computers to protect them against drops and spills. Protect your expensive electronics from damage with DIRECTV PROTECTION PLANS. DIRECTV has been ranked as number one in Customer Satisfaction out of all other cable and satellite providers. * Yet, like most TV customer service, DIRECTV receives mixed reviews. Many customers report friendly interactions and helpful care agents who provided the information they needed to make a decision about their service. Others felt that customer service was rude and dishonest. Overall, contacting DIRECTV customer service may be hit or miss. People can get a hold of DIRECTV customer service over instant chat or phone. Their general support phone service is available between 8 am and 12 am E.T. and their technical support is available at all hours. DIRECTV heavily pushes the use of their help center where you can look up answers to your questions or receive troubleshooting support. *From a 2017 ACSI survey in which customers ranked their TV providers. Make sure you unsubscribe from premium channels if you want to avoid being charged for these once your 3 free months are up. The same goes for the free NFL Sunday Ticket which is included with some plans. Make sure you cancel your subscription before it automatically renews the following year, or you will be charged full price. Since DIRECTV charges you an additional $7 per month for each TV you hook up to your service, your bill can increase significantly if you start getting DIRECTV in every room of the house. It may be more economical to hook up just one or two TV’s – your first one is included – and take advantage of DIRECTV Everywhere to watch shows on your computers and tablets. Watch your shows with DIRECTV Everywhere instead of paying extra to hook up multiple TVs. DIRECTV offers a variety of bundles with AT&T services and third-party internet providers. You can bundle your DIRECTV plan with AT&T internet, mobile, or home phone services. DIRECTV also partners with HughesNet, CenturyLink, Viasat, Cincinnati Bell, Mediacom, and Windstream. You can save up to $10 per month when you bundle with these internet providers and $15 per month when you bundle with AT&T wireless plans. You’ll be prompted to sing up for AutoPay when you initiate online checkout with your DIRECTV order. If you opt-in, you’ll save $5 per month. AutoPay automatically charges your monthly bill to your account, so you don’t have to remember to pay each month. DIRECTV has a lot of things to love, such as full country-wide availability, one year of discounted prices, and the ability to watch live TV everywhere on your portable devices. With all the add-on options like premium channels and international packages, DIRECTV has something for everyone. Even their most affordable plan has a huge selection of channels. Sports fans will love the included NFL Sunday Ticket in select plans, as well as the additional features like Mix Channels where you can watch multiple sports broadcasts at the same time. Furthermore, the DIRECTV Genie HD DVR and Genie Mini are solid pieces of equipment for watching and recording shows. DIRECTV may not be the best option for condensed apartment living or condos where mounting a satellite dish isn’t realistic. However, people living in suburban or rural areas are prime candidates for DIRECTV. Though DIRECTV is fairly affordable for the first 12 months, your monthly fees will increase a lot in your second year. For this reason, DISH may be a cheaper option although they provide a slightly smaller assortment of channels to choose from. Overall, you won’t go wrong by choosing DIRECTV over traditional cable. We recommend the ENTERTAINMENT package for a healthy mix of popular entertainment, sports, and affordability.